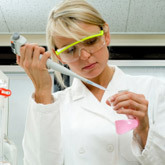 Chemicals are used for many applications in offices, laboratories, workshops and outdoors. Laboratories and workshops, in particular, may handle, use and store a large range of chemicals, some of which have the potential to affect people's health and cause damage to property or the environment. When working with chemicals and scientific equipment, knowledge of appropriate safety protocols and procedures is essential. These guidelines outline how to safely use, store and dispose of the myriad of chemicals we work with every day at UWA in our laboratories, workshops, kitchens, grounds and studios. Part A - provides an overview of necessary steps to ensure compliance within UWA. Part B - gives more detailed information on individual subjects within chemical safety, management and the relevant legislation. Part C - comprises appendices including a glossary of terms and advisory materials. Safety, Health and Wellbeing is available to advise on the implementation of chemical management and welcomes feedback on the new Chemical Management Guidelines.